Osteoporosis develops when bones lose minerals faster than the body replaces them, meaning the bones decrease in mass and density. Over time the bones become more fragile and brittle. Osteoporosis is often called a “silent” disease as the bone loss stays hidden until you see the effects, eg. a fracture, Dowagers hump, loss of height. The most common bones affected are the hip, spine, wrist, ribs, pelvis and upper arm. Osteopenia is the definition of having lower than normal bone density and is one stage before osteoporosis. The greatest amount of bone is built during childhood and adolescence. 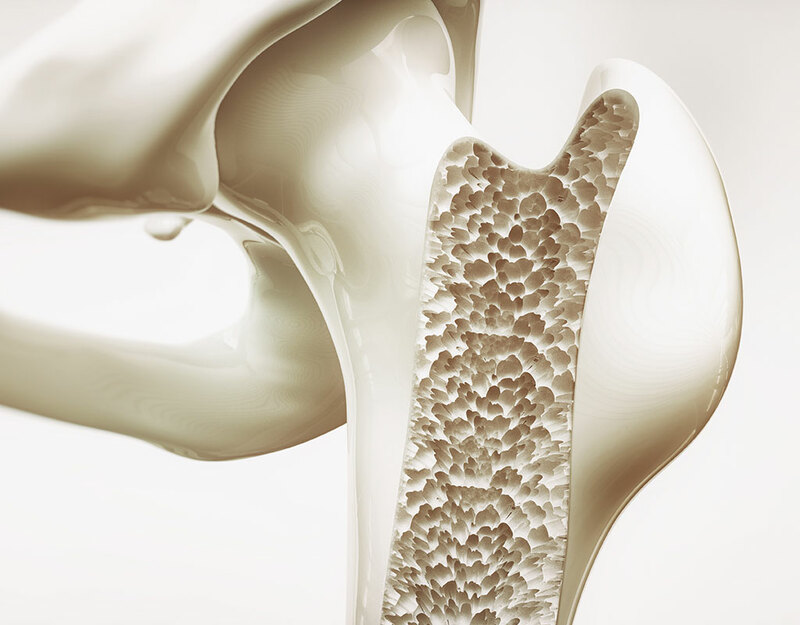 By age 18 in girls and 20 in boys, nearly 90% of “peak bone mass” is reached. However, the amount of bone tissue can keep increasing until around age 30. Once “peak bone mass” is reached we start to lose bone density (as well as muscle strength) each year as we age. It is therefore important to build as much bone mass as possible early on in life. Low calcium and low vitamin D levels. To reduce the risk of developing osteopenia or osteoporosis it is recommended that you eat a healthy diet with adequate calcium, get sufficient vitamin D, quit smoking, reduce alcohol and coffee intake, and undertake regular exercise. Activities shown to specifically improve bone density include weight-bearing activities and strength training. Improve flexibility and posture and help reverse some of the postural changes as a result of osteoporosis. Before prescribing a physiotherapist-led exercise program it is important to distinguish between those people that have osteoporosis, osteopenia and those with normal bone density. For those people that do not have osteoporosis, the aim is to increase bone density and prevent bone loss. Weight bearing exercises need to have an effect on the bone, be regular and need to be moderate to vigorous in intensity e.g. jogging, jumping, stair climbing, walking up hills, tennis, aerobics. Strength training exercises can include hand weights, resistance bands, machine weights, body weight. Machine and mat Pilates are perfect ways to achieve these aims. A diagnosis of osteoporosis requires a great deal more care and consideration when designing a Pilates program. People with osteoporosis require an individual program as there is a higher risk of fractures due to falls or inappropriate exercising. High-intensity exercises are not recommended, the aim is to maintain bone strength and reduce the risk of falls and fractures by improving posture, balance and muscle strength. Exercises to be avoided are those that place strain on the spine including trunk flexion (bending forward or sit-ups), twisting movements and high impact exercises. Good exercises include those that work the back, shoulders, legs and hips, areas that commonly lose density the most and result in more debilitating fractures. So if you are looking at preventing a loss of bone density, improving your muscle strength and bone density, or have a diagnosis of osteoporosis please see one the physiotherapists at Q Pilates. We are well qualified to assess you and provide an individualised program to ensure you are performing appropriate exercises for your condition.